The prime suspect, Juliet Phillips allegedly stole baby Testimony, a twin from the mother, believed to be close to imbecility. A woman, Juliet Phillips and her mother as well as a retired director in the Community Development Department of the Ministry of Women Affairs in Delta State, Collins Ogbor have been arrested over alleged stealing and sale of a two year old, Testimony, in Delta State. It was gathered that the trio were arrested at Idogbo in Ikpoba-Okah Local Government Area of Edo State by officers and men of the Nigeria Police Force from the “A” Division in Warri. 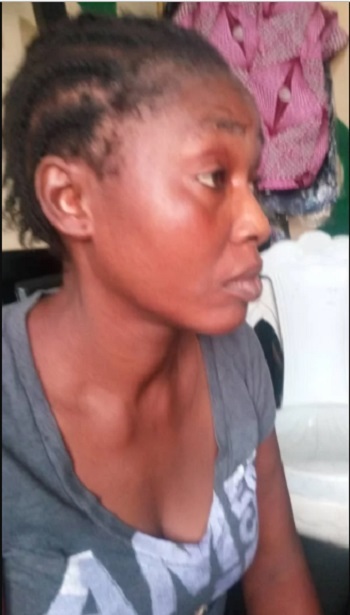 The prime suspect, Juliet Phillips, who operate an illegal orphanage, Godswill Ophanage at Ekpan community near Newton Agbofodo’s compound allegedly stole baby Testimony, a twin from the mother, believed to be close to imbecility, on November 28,2018. Phillips, it was learnt, took the two-year-old baby to Deliverance Orphanage operated by her mother in Ozoro community in Isoko North Local Government Area of Delta State. It was from the Deliverance Orphanage, which is registered with the Delta State Government, that the little boy was sold (adopted) to a pastor in the Redeemed Christian Church of God, RCCG, in Edo State at the rate of nine hundred thousand naira. The cleric, it was also learnt, has renamed the two-year-old boy, Favour, before he was traced to his house in Benin-City by the police. A retired director of Community Development, Ministry of Women Affairs, Collins Ogbor, is allegedly involved in the sale (adoption) of the boy to the pastor. A source within the “A” division police station, who craved anonymity, told Daily Post that the boy has been reunited with his mother. The police source said the files of the suspects, who are helping the police with useful information, will be transferred to the Department of Public Prosecution, DPP, on Monday for advice. The mother of the boy, who daily begs for alms at Effurun market, went for her usual business that fateful day when Juliet Phillips, accosted her pretending to be nice to her and the children. Immediately they arrived Igbudu market, Juliet hurriedly paid for herself before they got down from the Keke and before the woman finish paying and collecting her balance from the commercial tricycle operator, Juliet disappeared with the child she backed. Daily Post learnt that the vulnerable woman cried over her missing child in Effurun market, drawing the attention of sympathizers. In the process, the President of the Nigerian Welfare Fund, Comrade Joshua Omorere was called and after carefully listening to the plight of the woman, incidented the matter to the police, who promptly launched investigation into the matter which led to the arrests of the trio.